Culture Matters! We are delighted to share a brief year end overview of the 2018 and 2019 TRIP grants. We are honored to partner and advocate with nonprofit organizations worldwide. 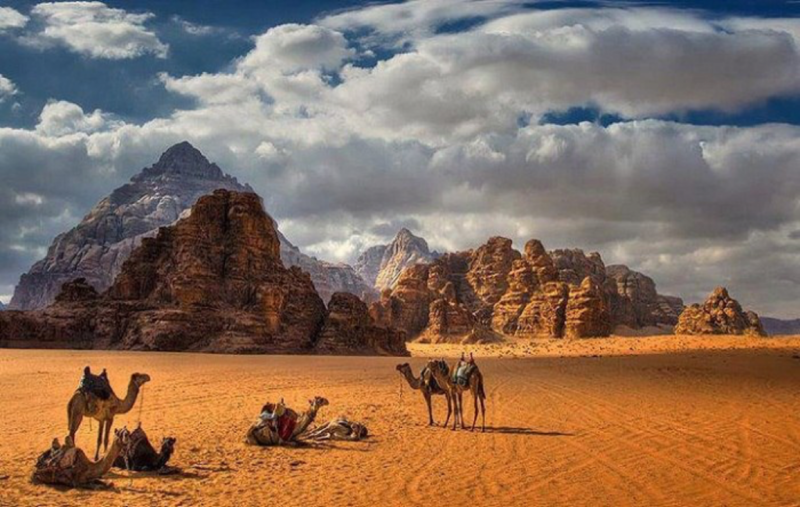 We accomplished two large destination grants this past year; a first ever Middle East/Jordan event for Tourism Cares (pictured below), with 100 leaders focused on 12 Social Enterprise developments, and the World Travel & Tourism Council’s Social Impact event in Seville, Spain. Our Family Fund for International Research provides ongoing support to Barnard College faculty conducting research and fieldwork on topics spanning international relations, peace building studies, economics, and human rights. We supported The Center for Arts, Technological Studies and Conservation in Denmark, a major center for technical study, scientific research and active conservation of fine art from around the world to conduct research and conservation of degrading Old Master drawings in the collection of the National Gallery of Denmark. Peru’s ‘Turismo Cuida’ Plan Wallata is a 2017-21 five-year plan to support Incan communities in the city of Ollantaytambo in the Sacred Valley – along with a new museum opening! 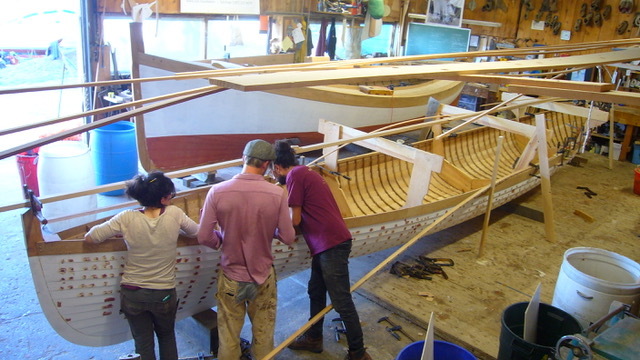 One of America’s finest boat building institutions, The Apprentice Shop (pictured above) in Rockland, Maine, receives multi-year support from TRIP with full scholarships dedicated to internships for a recent student from Greece and applications for other European youth interested in traditional craftsmanship. 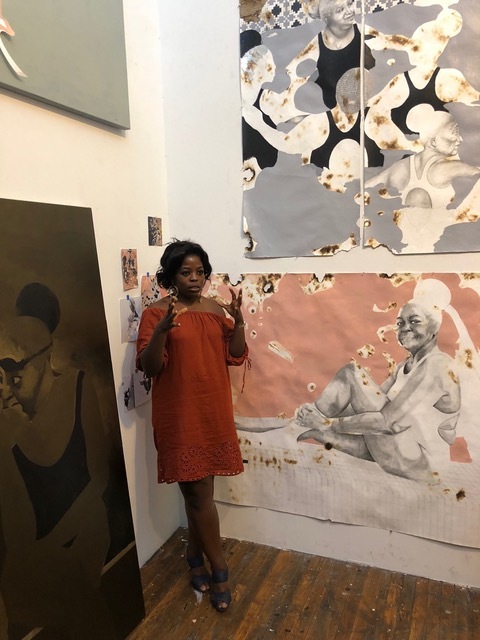 TRIP continues to support the International Studio & Curatorial Program in Brooklyn (pictured below), to provide early or mid-career residents from Africa with studio and professional opportunities to further their creative careers. TRIP has collaborated with IRIS, the Integrated Refugee & Immigrant Services, for a three-year grant sponsor to help with the integration of refugees into the American culture in Fairfield County, Connecticut and New York. And the Cultural Alliance of Fairfield County was a new grant recipient this year. With over 600 members throughout the community, they created a new website that now features thousands of cultural events and openings. Once again, it has been an honor to work with all of you in this past year, and we look forward to the bright new year full of cultural engagements and great work from our grantees! P.S. – Robin is featured in Advantage, a global magazine, with a terrific article titled ‘Transcending Borders for the Greater Good’ found here on pages 44 and 45 that we are delighted to share with you! Brooklyn, New York—For the second year in a row, Tauck Ritzau Innovative Philanthropy (TRIP) is underwriting the Tauck Ritzau Residency for artists from Africa, which runs this year from June 1, 2018 through August 31, 2018, at the International Studio and Curatorial Program (ISCP). Nigerian artist Modupeola Fadugba (b. 1985), whose elegant and socially concerned paintings and works on paper address issues of identity, representation, and access, was selected as the 2018 Resident from a pool of more than 100 applicants across the African continent. 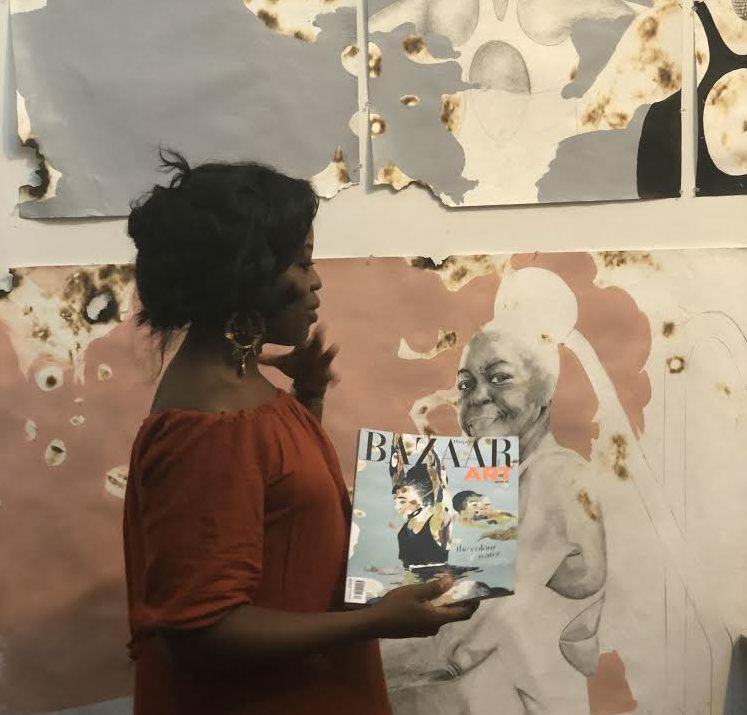 Ms. Fadugba’s work has been the subject of solo exhibitions in Africa and France and her figurative paintings of African and black American synchronized swimmers were recently included in a group exhibition at the Royal Academy, London and appeared on a spring cover of a recent international issue of Harper’s Bazaar. The Africa Centre, a Cape Town-based pioneering, progressive non-profit organization, carried out the search. This is the second ISCP residency underwritten by TRIP with support from The Dennis Elliott Founder’s Fund, named in honor of the founder and first director of ISCP. Last year’s inaugural recipient was Kiluanji Kia Henda (b. 1978), a self-taught Angolan artist and winner of the Frieze Art Award who works in photography, performance, and video. Although Africa enjoys a thriving contemporary art scene, there is limited funding for world-class residency programs for young and promising artists to produce and present new work and to make connections that will further their career. Housed in a former factory in Brooklyn and featuring 35 light-filled work studios and two galleries, ISCP is the most comprehensive visual arts residency program in New York City and the fourth largest in the world. Ms. Fadugba, who studied chemical engineering and education at Harvard but has no formal training in studio art, confesses that her academic background might pre-dispose her to conducting “large-scale experiments”—she paints on papers that she carefully burns in her studio. This summer, she receives full use of a private studio; assistants; a stipend for living and housing expenses; and extensive professional development opportunities, such as studio visits from art critics and participation in talks and exhibitions. On a warm July night, Ms. Fadugba presented a visually striking ongoing series, “Synchronized Swimmers,” which depicts an underwater world filled with dynamic, moving bodies weaving stories about teamwork, friendship, and unity during a special “Artists at Work” presentation. Deeply interested in the social history of communal swimming pools, Ms. Fadubga said the location of her residency in New York City allowed her to find inspiration in The Harlem Honeys and Bears, an acclaimed all-black synchronized swimming team for senior citizens who perform water acrobatics and offer free swim lessons to children to reduce the likelihood of childhood drowning. Previously, she had depicted synchronized swimmers in Lagos, Africa in her representational works. Ms. Fadugba described a lack of swimming culture for black and African American communities in the U.S., noting that black and African American children in the U.S. drown at five times the rate of other children. In fact, according to the USA Swimming Foundation, 70 percent of African Americans do not know how to swim. “How can I think about synchronized swimming in a more meaningful way?” she mused during the talk in which she projected images of her work. From August 24, works created Ms. Fadugba at ISCP will go on view at Gallery 1957 in Accra, Ghana. As of this writing, we are delighted to learn that Ms. Fadugba’s residency has been extended for one month, until the end of September 2018, with underwriting provided by Gallery 1957. 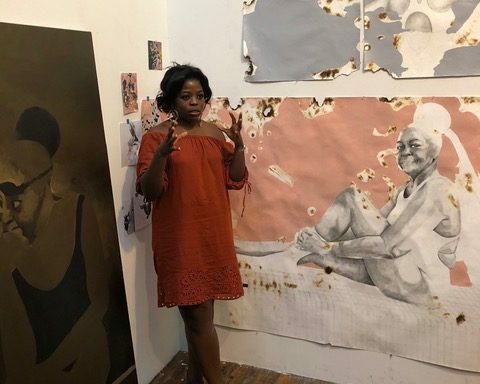 Images: 2018 Tauck Ritzau Resident Modupeola Fadugba during a recent studio talk at ISCP, Brooklyn, NY. This is the first in a series of interviews TRIP will feature with grantees to bring attention to issues and remarkable innovators in global culture. TRIP spearheaded the development of The Colleen Ritzau Leth ’08 Family Fund for International Research to provide ongoing support to Barnard College faculty conducting research that promotes mutual understanding between diverse societies and allows Barnard’s exceptional faculty to engage deeply in original studies on topics spanning international relations, peace building studies, economics, and human rights. 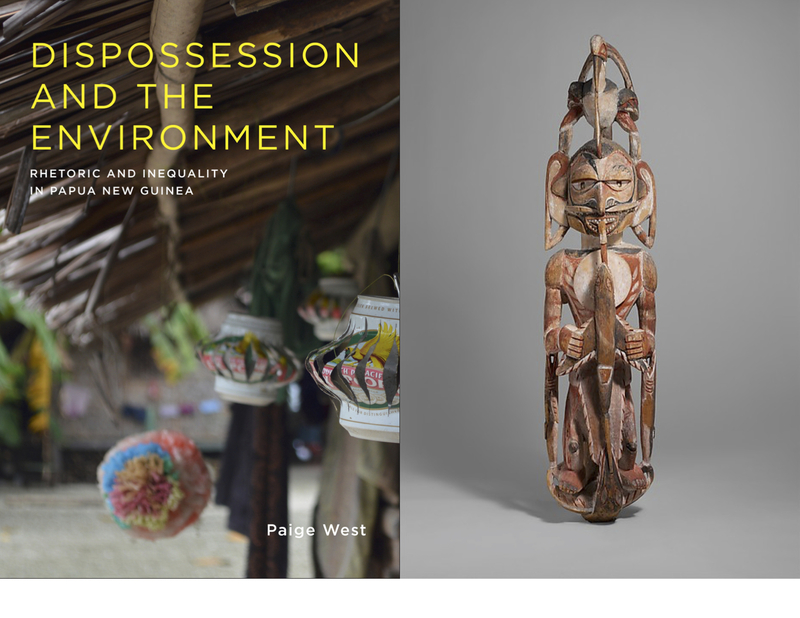 The inaugural grant was awarded to Professor of Anthropology Dr. Paige West, who recently published Dispossession and the Environment (Columbia University Press, 2016), a study on the impact of NGOs, tourism, and foreign visitors on Papua New Guinea. Dr. West is currently working to preserve the island’s threatened cultural tradition of Malagan—intricate, layered carvings that communicate ancient histories and local knowledge through their motifs. Q. How did you become interested in Papua New Guinea? I became an anthropologist because of Papua New Guinea. When I was a child, like so many of us, I read National Geographic. So the sense of other people and others places was in my consciousness from an early age, and I was interested in Papua New Guinea. As happens, I forgot about it. [But] during my senior year of college, I read a book by Roy A. Rappaport (d. 1997), [the anthropologist who wrote about the relationship between the island’s culture and economy]. I realized in that class that I was incredibly passionate about the environment and culture—the island is both the most biologically and the most culturally diverse place on Earth. Q. You are now an authority on Papua New Guinea and respected locally. In fact, you were recently approached by Papua New Guineans themselves. What did they share with you? My research partner and I were approached by elders from the New Ireland communities. New Ireland is one of the large islands to the north of New Guinea. They were concerned about Malagan carvings—the lynchpin of local ceremonies and culture. These elders explained that there are only six master carvers alive today and these men are in their late 50s and early 60s. When they die, the knowledge of both Malagan carving and the underlying ontology and epistemology of the Malagan ceremonies will be lost. Q. What makes the objects important and unique? Malagan carvings are represented in public collections all over the world, like The Metropolitan Museum of Art and the American Museum of Natural History. These are the most collected, most spectacular objects from the island. They have this incredible power because their motifs contain family histories, origins, and crucial knowledge about the relationships between people, plants, animals, and spirits. The carvings themselves are not objects of value for Malagan culturally; rather, it is the imagery, or the motifs, that are carved onto the objects, that contain what is of value. Only master carvers can produce these carvings and there are strict rules for when, where, and to whom a carver can pass on his craft and knowledge. Q. How are you using the funds? Prior to this gift, we received a U.S. Ambassador’s Fund For Cultural Preservation Grant to begin working with the last living master carvers to document their knowledge. This support is unspecified and unrestricted, which is allowing us to really move forward with this project, expand our team of collaborators, and do environmental and cultural conservation together. It is allowing us to buy tools; make introductions for carvers; and connect with researchers at institutions like The Metropolitan Museum of Art and the Australian Museum. The support from The Colleen Ritzau Leth ’08 Family Fund is also supporting our long-term goal, which is to help Papua New Guineans who want to conserve and revitalize their tradition access the people who can help them do it. We want to get these carvers hooked into global networks of art and conservation that value these objects and help the carvers articulate to younger people in their societies why Malagan matters. Q. You mentioned that the funds have allowed you to do environmental and cultural conservation together. How so and what is the urgency? We believe that this kind of work can really help articulate the connection between art and the natural world, and we want to help local people understand why it so important that these traditions be talked about, discussed, and argued over right now. There is this really fundamental connection through these objects between the culture and the environment in Papua New Guinea. The environment is changing very quickly: sea levels are rising rapidly and there is extensive bleaching of coral atolls. The Malagan carvings have five different layers of stories in them and all of these stories have an ecological and cultural and ecological component. The ecology motifs are very site specific to where the carvers are from. Most of these villages will have to move [as a result of rising sea levels], and the ecological basis for their societies will be gone. These carvings house the memory of that. Q. 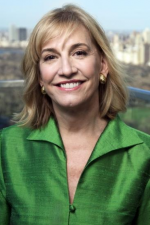 The Colleen Ritzau Leth ’08 Family Fund for International Research is a permanent endowed fund that allows a diverse cross section of Barnard’s exceptional New York City faculty to engage deeply in research. As the inaugural recipient, why are funds like this important? It is very important because it will help myself and other faculty to develop new kinds of research projects and programs that might not traditionally fit within the funding structure of our disciplines. This fund will help the faculty at Barnard break down interdisciplinary boundaries when we are asking new kinds of questions. Q. In closing, your recent book is a searing study of how local knowledge is devalued and eroded by journalists, developers, surf tourists, and conservation NGOs in Papua New Guinea. What is the connection between dispossession and the threatened knowledge of the Malagan carving tradition? Europeans, Americans, and Australians have built academic careers, museum collections, and scientific bodies of knowledge that really started in Papua New Guinea. There is this way in which the people and the places from which this knowledge was extracted have never benefited directly from that knowledge, nor have they ever had the opportunity to work in the fields developed through that knowledge. When I think about dispossession, in addition to extraction of natural resources, for example, I think about this more ephemeral thing—knowledge. Culture Matters! We are delighted to share a brief overview of 2016’s new TRIP projects and grants. Highlights include thought leadership gatherings, exhibitions and events at local cultural organizations including the Queens Museum, The Trust For Public Land and The Metropolitan Museum of Art, as well as National Park Centennial projects, from Arizona to Florida. Internationally, we were excited to assist a new World Monuments Fund partnership with Cuba in dialogue for its rapidly unfolding future; develop a new initiative for cultural projects in Jordan; and support academic research on the diverse cultural landscape of Papua New Guinea. Innovation: We keep a constant eye out for innovative cultural projects that spur economic development and a shared appreciation for authenticity and cross-cultural understanding in a rapidly changing world. In 2016, we once again elected to support projects that delivered on this mission. The vision of The Friends of the QueensWay is to transform the abandoned and blighted 3.5 miles of the former Long Island Railroad Rockaway Beach Branch into a new linear park and multi-cultural greenway—improving quality of life while reaping economic benefits for residents, businesses and visitors to Central and Southern Queens. The Trust for Public Land creates new parks and protects land for public use. TRIP funded a dynamic conversation at the Queens Museum in October, convening 20 cultural and civic stakeholders to discuss innovative strategies for engaging community, political, and business leaders in arts and cultural programming. The Queensway is expected to debut in 2020. As of this writing, an incredible four-month exhibition is on view at The Metropolitan Museum of Art—Jerusalem, Every People Under Heaven—featuring a multiplicity of perspectives on the cultural heterogeneity that Jerusalem has embodied for centuries. We send our congratulations to Barbara Drake Boehm, Paul and Jill Ruddock Senior Curator for The Met Cloisters and Melanie Holcomb, Curator, Department of Medieval Art and The Cloisters for their brilliant research, diplomacy and vision in executing this landmark study and securing such important loans for display in New York City. The Colleen Ritzau Leth ’08 Family Fund for International Research at Barnard College awarded a grant to Professor of Anthropology Dr. Paige West, who published her research this year in the book Disposession and the Environment, a study on the impact of NGOs, tourism and foreign visitors on Papua New Guinea and furthering inequalities in a globalized world. Our grants support college faculty conducting research that touches on the relationship between culture and international affairs or policy, and that work to promote mutual understanding between diverse societies. This permanent endowed fund allows a diverse cross section of Barnard’s exceptional New York City faculty to engage deeply in international research spanning the subjects of foreign relations, peace building, economics and human rights. In 2016, the 100th Anniversary of our 410 National Parks, TRIP was privileged to support the National Park Foundation (founded in 1967) and several park projects that develop future stewards of these national treasures. TRIP’s grants supported an exciting new Youth Center scheduled to open in 2020 at Yellowstone National Park; an artist in residence program at Everglades National Park; and the program Honoring Tribal Connections at Desert Watchtower of Grand Canyon National Park. Robin enjoyed volunteering for several events at Grand Canyon and Ellis Island. In 2017, we look forward to finding new ways to join together in energizing new cultural connections at our parks. We are delighted to announce that our VP Colleen Ritzau Leth was selected by the University of Oxford to deliver a TEDx talk at Cambridge University in April. “Why Museums Matter—Seeing the Present as Future” touched on several key components of TRIP’s mission, including the value of museums in providing space for intercultural dialogue and mutual understanding. In 2016, Robin sponsored a new book: The Beautiful POND: Old Mill and Compo Cove, Westport. All proceeds were donated to SoundWaters, doubling their outreach to STEM programs for Connecticut youth and enlisting the next generation of stewards for local waters. She supported local conservation and cultural efforts and many events to raise awareness and support of traditional Connecticut coastal issues. In closing, we look ahead to a very exciting 2017 for TRIP and our partners, with new engagements in our home cities as well as a number of international grants supporting initiatives in USA, Cuba, Greece, Jordan and Peru. We remind our friends and collaborators of our very simple mission: culture matters. And we ask you to forward any interests of your own. It was a pleasure to collaborate on projects that impact communities and make a lasting difference on the way we see the world and one another. Thanks to everyone who supported our journey this year. 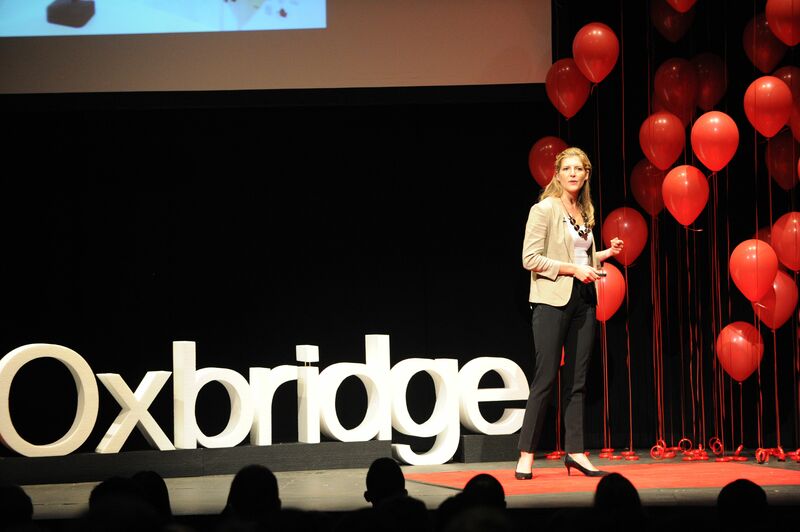 Cambridge – Colleen Ritzau Leth, Vice President of TRIP and an MBA student at the University of Oxford, was recently invited to deliver a TEDtalk at TEDxOxbridge, an annual TEDx event co-hosted by the Universities of Oxford and Cambridge. This year’s event included speakers from across the business, academic and social sectors. Colleen is a specialist in museum management and the history of collecting. During her talk, she asked audiences to consider the role of art history and museums in a post-digital world. In an age replete with entertainment stimuli, visitation rates to encyclopedic museums around the world are rising. But why do museums matter today more than ever before, and what do historic objects and images tell us about ourselves? The following is a condensed and edited excerpt. You may enjoy Colleen’s complete talk here. We live in a world of advanced technology. Much of our cultural production has gone online; we can access millions of images, centuries of art and endless information with the click of button. And while attendance at concert halls and theatres is down throughout most of the world, museum visitation is up by as much as 50 percent in the past 10 years in many countries. So how does the traditional art viewing experience manage to compete for our precious time? The answer might be found by considering a well-known painting by Paul Gauguin. Gauguin was broke and slowly dying on a remote Polynesian island, without career prospects, indebted to friends back in Paris. And still, he painted for perpetuity’s sake. Facing the end of his life, he added a small detail in the corner, at the border of his last creation. It reads: Where Do We Come From? What Are We? Where Are We Going? Every year, 1.2 million people stand in front of this painting at the Museum of Fine Arts in Boston, and ponder this question. Gauguin got to the heart of it: art seeks to provide answers to these essential questions: Where do we come from? What are we? Where are we going? Sometimes the answers are found in giant oil paintings, more often they’re glimpsed in everyday objects: a small Greek urn, a 16th century map, even Edward Snowden’s laptop now on view at the Victoria & Albert Museum in London. Museums are not graveyards of dead art or storehouses of the past: they are active records of ‘us’ in the broadest most universal, global and cosmopolitan sense of the word. To wander and wonder is to activate a special kind of enlightened curiosity about the world, in which we see ourselves in the creations of someone else and come to know ourselves as part of a continuum of shared human identity. This is so critically needed in today’s world. Museums are a means of dissipating ignorance and promoting tolerance. I’ve spent most of my life in the art world. And people often ask me: if disaster struck, and you had to save one object, what would it be? Would it be the Rembrandts, the Mona Lisa, the mummies, the $120 million contemporary sculpture? No. It would be the Lamassu—a towering, odd, enchanting hybrid species. Part bird, part lion, part bull, part bearded king, created 5,000 years ago by the ancient Assyrians. I’ve been curious about lamassus for as long as I can remember, and I still get a bit of childish delight when I turn a corner in a museum and see one staring down at me. Lamassus were once as prevalent throughout the Middle East as representations of Christ would become throughout Western Europe 4,000 years later. They stood at the gateways of cities and temples in an empire that stretched from present day Egypt to Iran. They were believed to embody the power of the rulers they protected. Lamassus were icons of a tremendously imaginative world; they drew their power by straddling that intriguing, liminal zone of sign and signified, animal and human, terrestrial and mythological, local and foreign. If the art of art history is the ability to use images to trace relationships between disparate cultures, to find connectivity and shared conversations across place and time, then the Lamassu is an exemplary place to start. They were prevalent throughout the ancient world, appearing on coins and inscribed onto clay seals—the original email signature. This hybrid animal deity went on to form the basis of many of the world’s great art historical traditions. The Lamassu appears not only in the art of ancient Babylon and Assyria but also in the arts of ancient Persia, Judea, we even see traces of it in depictions of the four Gospels in the early Christian period when the Tetramorph took on the wings of the eagle, body of the bull, and feet of the lion to depict the spread of Christianity. By 1860, the birth of archaeology led to a mass excavation of these monumental sculptures from the sands of Iraq, shipped overseas to the secular temples of new national museums in Berlin, London, Paris, New York and beyond. 100 years later, they began to appear in French, British and U.S. military insignia, including during the Gulf War. These images exemplify the continuum of a conversation we as a human race have shared across cultures and across time. They are not merely antiquities fixed in a lost past, but cultural capital that has been borrowed, reused, and revalued in fascinating ways that have much to tell us about the linkages between us and others, here and there, then and now. They remind me that culture knows no political boundaries; it has always been dynamic and hybrid, formed through contact and exchange. Which is why their present use as pawns in a disastrous war of iconoclasm and backwards anti-idolatry is so deeply troubling. Today, nearly all of these beautiful ancient sculptures of the Middle East have been severely damaged if not destroyed by ISIS or Daesh. A part of our story is being erased. The ongoing conflict in Iraq and Syria is the most significant humanitarian crisis of our age and the most widespread loss of historical material since the Second World War. The Baghdad Museum was once home to 7,000 years of art history. I’m happy to say it’s reopened 12 years after its looting in 2003 when 15,000 objects were lost. Of course, this is but one success story in a sea of casualties. We live in a time of resurgent nationalism and sectarian violence, factionalism and narrow-mindedness. If we are to foster mutual understanding and appreciation for our shared past, and if we are to remain curious about difference rather than destructive of it, we must do a better job of protecting not only historical objects, but also encyclopedic museums—microcosms of the world’s cultural legacy where curiosity can thrive, where we can learn to forget who we think we are and see ourselves as part of a broader historical narrative. There are 55,000 museums in the world, thousands of heritage sites and many of them need your support. Continue to visit, continue to remain curious, let yourself wander and wonder, be captivated by an object made 5,000 years ago. For only by valuing and protecting the remains of where we have come from, will we know where we are going. Tauck Ritzau Innovative Philanthropy (TRIP) makes multi-year investments internationally towards economic development through cultural heritage. Read our recent news or reach us at rdemaria@foundationsource.com.